Please check for pictures and items list the Tuesday evening before each sale or join our mailing list and be notified when pictures and item lists are posted. 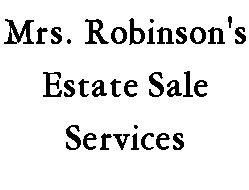 Mrs. Robinson's Estate Sales has been servicing Southeastern Michigan for 23 years. Our sales generally last for two days. Sales are conducted on Saturday and Sunday to insure that your sale will be well attended by customers who work Monday thru Friday. Our sales generally average 1000 + customers over a two day period!! If you are in need of a professional, well run sale, please give us a call at 734 - 675-6586. We will gladly answer any questions you might have.